Jake only knows about four words so he doesn’t say much, but the smile on his face says it all, his grandfather Manuel Reyna Jr. said. 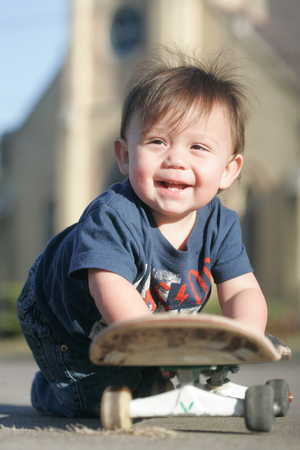 “It’s just so amazing that he knows when to stop and go and how to put on the brakes,” Reyna said. Jake picks up momentum by pushing off with his left leg and when the pavement is coming to an end simply drags his left foot to stop. Like most 1-year-olds Jake has yet learned to walk in shoes. 175-foot long mini Mega Ramp with a mind-blowing 30-foot drop from an 18-foot vertical ramp (the equivalent of a three-story building), and the first-ever rail contest over a 20-foot gap with $40,000 in prize winnings, one of the biggest purses ever offered in Sonoma County! Some of the world’s top skate legends will be present for demos, judging, and Meet and Greets, including Steve Caballero and Christian Hosoi on Friday June 12, plus Thrasher magazine skater of the year and X-Games Gold medalist Bob Burnquist, Danny Way, Andy MacDonald, and Buster Halterman. Also expected are Adam Taylor, Jake Brown, Lincoln Ueda, Rob Loriface, PLG and Omar Hasssan. The Eco Cup skate zone is surrounded by majestic redwoods and blue skies – close to the 101 Freeway but also a world away. 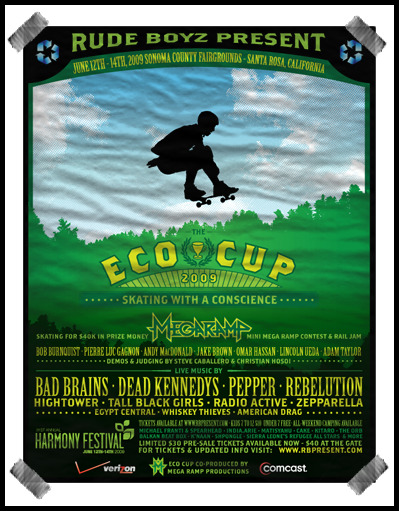 Adding to the excitement are the action sports-friendly headline bands including legendary punk/reggae/activist bands Dead Kennedys and Bad Brains with Pepper and Rebelution. Also performing over the weekend are Hightower, Tall Black Girls, Zepparella, Egypt Central, Whiskey Thieves, American Drag and Radioactive as MC. Approximately 10 of the world’s top skaters are expected to compete in the Best Trick and Best Jump categories, and prize money will be awarded to each competitor. 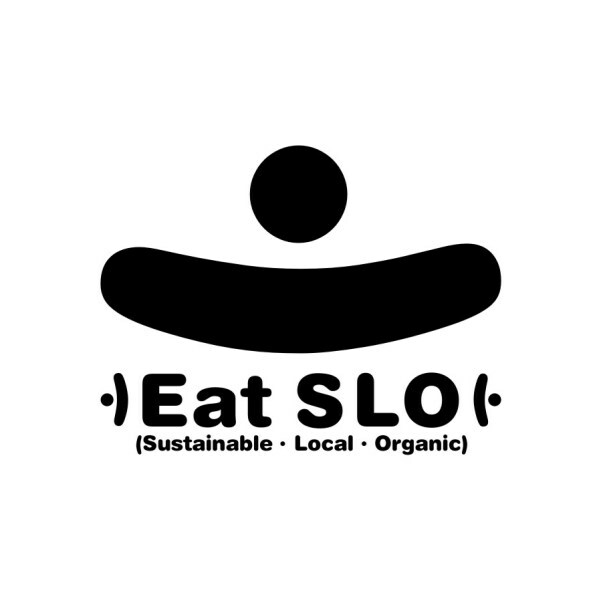 The Eco Cup trophy will be created out of recycled and repurposed mixed media, and the steel and plywood-constructed Zone will be reused indefinitely after this one-time event. The mini Mega Ramp and rail is reserved for the guest skaters, but Festival attendees of all ages are invited to bring their boards and “drop in” at the skate zone as participants, competitors, or spectators. The Rude Boyz Present Eco-Cup skate zone is being sponsored by Comcast and Verizon, and will be open daily Noon to 8:30pm June 12, 13, and 14. Entrance to the skate zone is included with paid admission at the front gate. Limited $30 pre-sale tickets are available now ($40 at the gate). This year, kids 6 and under are FREE and kids age 7-12 are $10. A fast-paced documentary, STUNTWOOD takes a comprehensive look at skateboarding through the journey of the skateboard itself. From the maple forests of the Great Lakes Region to the urban streets where skateboards thrive, STUNTWOOD follows the wood through factories and the processes of becoming a skateboard and delves into how the board profoundly affects people, art, and public spaces. Feeding a multi-billion dollar international industry, the skateboard has created a fast-growing sub-culture that has become mainstream while still staying true to its fiercely personal, independent, and creative roots. This unique documentary celebrates the wood and the culture that surrounds it. 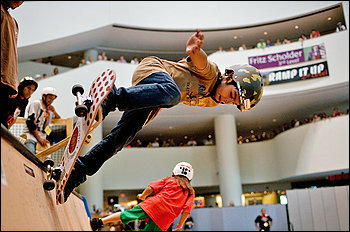 Punky, up-tempo music issues forth at a museum-appropriate volume, and the Smithsonian’s Native Skate Jam begins. The skaters — some in skinny jeans, some in Vans or Chucks, some in Native Skates T-shirts — politely take turns. One leans down and discreetly applies a sticker to the otherwise unblemished surface of the half-pipe. Who are these Hot Skaters?